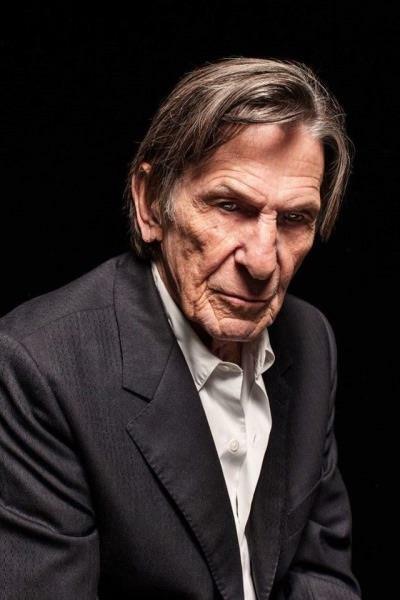 My Weekly Spock: Barnabas Nimoy? Sorry I’m a little late today — very busy at work! In one of his last photo shoots, Leonard Nimoy posed in this very dramatic, kind of spooky pose (Those glowing eyes!!) I think he would have made an excellent vampire- like Barnabas Collins from Dark Shadows! It’s a a really incredible portrait. Does anyone know if there’s more from this sitting? This entry was posted in Leonard Nimoy, My Weekly Spock and tagged Barnabas Collins, Dark Shadows, Halloween, Leonard Nimoy, portrait. Bookmark the permalink. Yes He would have been, he just had that face even when he was young and as he got older. I thought of that a few years ago, too. This picture makes me think he was tired. He might have been a good Barnabas Collins, but forty years ago when he played Paris on the old Mission Impossible series. Looking at him here I think of Abraham Lincoln. Yes, I thought he looked tired too. Bless him. I think he would have made a great Abe Lincoln! His eyes may be old, but you still can see Leonard Nimoy and Spock there eyes will never change.